The BBC has a primer here, including Rousseff's latest big move. She appointed "Lula" as her chief of staff, which puts him, as a Cabinet member, out of the prosecutorial reach of all but the nation's Supreme Court. The Wall Street Journal floats another theory: "Analysts believe he is effectively replacing Ms. Rousseff in all but name, filling the role of a kind of unofficial prime minister" and essentially priming himself for another run at the presidency in 2018. Meanwhile, a judge released phone recordings between the two that suggest Rousseff was concerned with helping Lula avoid arrest. And thousands of anti-government protesters took to the streets Wednesday. The AP has details. As for the scandals, Lula is accused of taking kickbacks from energy giant Petrobras, allegations uncovered in Operation Car Wash. See the Atlantic. Rousseff is accused of illegally borrowing money from state banks to cover budget shortfalls—shortfalls that may have been caused by that Petrobras scandal. See the BBC. Sound like House of Cards? There's a quiz comparing the two at Americas Quarterly. 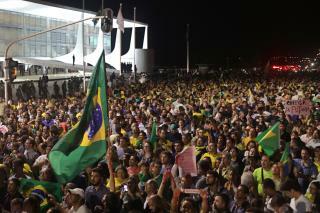 Because Brazil didn't already have enough problems: The New York Times lays them out. Lulu? "To Sir with Love?" Sounds or appears to me like the current prez is tied to it as well.